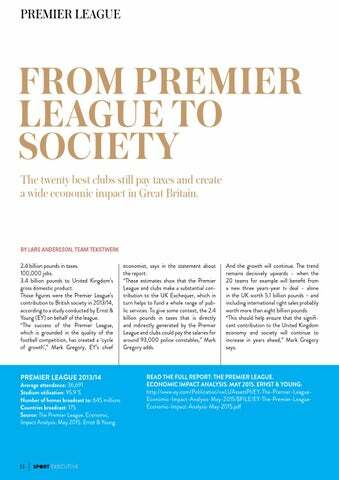 FROM PREMIER LEAGUE TO SOCIETY The twenty best clubs still pay taxes and create a wide economic impact in Great Britain. Average attendance: 36,691 Stadium utilisation: 95.9 % Number of homes broadcast to: 645 millions Countries broadcast: 175 Source: The Premier League. Economic, Impact Analysis. May 2015. Ernst & Young. economist, says in the statement about the report. “These estimates show that the Premier League and clubs make a substantial contribution to the UK Exchequer, which in turn helps to fund a whole range of public services. 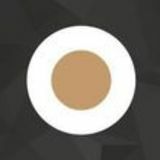 To give some context, the 2.4 billion pounds in taxes that is directly and indirectly generated by the Premier League and clubs could pay the salaries for around 93,000 police constables,” Mark Gregory adds. And the growth will continue. The trend remains decisively upwards – when the 20 teams for example will benefit from a new three years-year tv deal – alone in the UK worth 5.1 billion pounds – and including international right sales probably worth more than eight billion pounds. “This should help ensure that the significant contribution to the United Kingdom economy and society will continue to increase in years ahead,” Mark Gregory says.